Aaaah - Finally, Elmo get's a Pupusa of his very own! Pretty good, huh? I was waiting all weekend for your post! 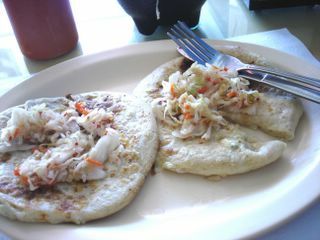 Pupusas are now on my "have to get them every so often" list. Pretty DAMN good! Hours after those pupusas, I wanted more! My palate was still craving them. It's just a lovely combination of flavors...feels like comfort food with a kick! Yay! Looks like everyone's losing their pupusa virginity this summer! 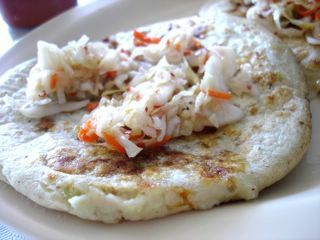 It's true what you said in your comment about pupusas...you just keep craving them. Like I always say about addictive food--they must put crack in 'em. Lovely post, and excellent photos. San Sivar is relatively clean for a hole in the wall. You wanna see a dump? Try Pupuseria Cuscatlan 412 N. State College Anaheim, next to a car wash. Good pupupsas but totally nasty bathroom, which generally doesn't bug me that much, but here - yiii. Yeah unfortunately, I doubt this place will do delivery for your late nights at the office....but I'm certain they are open on the weekends! Pupusas are going to be my major addiction now. I'm glad my first time was at such a worthy place! Thanks again for the heads up on this place. I know I'm going to be a regular here. BTW, feel free to use my post or photos when you decide to share your review with the rest of Chowhound. I'll piggy back my review to yours as a reply. i have yet to try this. i'm sure i can find one in LA. any suggestions anyone? Check out Pam's blog...she had hers at a place called Atlacatl in L.A. Looked pretty damn good too! Great tip! I'll need to check that out someday! After reading your comments, I decided to go check out the place myself and I was plesantly surprised at how authentic San Sivar really is. I would recommended it to anyone. Santa Ana, CA 92701. Great pupusa and the bestest HORCHATA, not the regular mexican cinnamonly horchata. It has a nuttier taste to it. I need a curtido recipe. Does anyone know how to go about making this? I just finished devouring my queso y frijol pupusas, and I have to say that they were the best I've ever had. My boyfriend is from El Salvador, and brought me what in his opinion were the best pupusas from LA one time, but these far surpassed his. 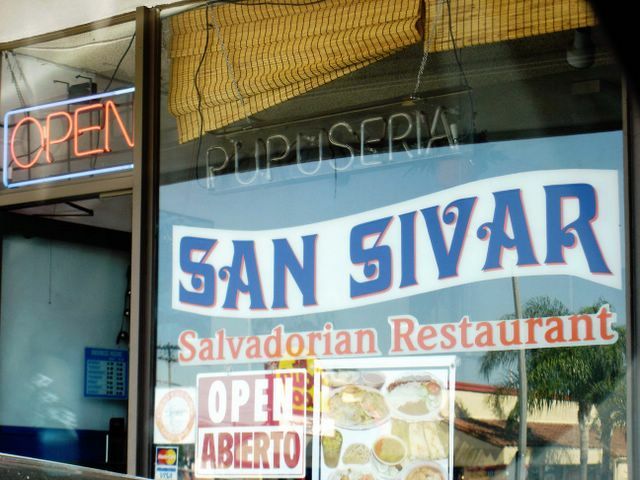 I couldn't be more thrilled that such a great pupuseria is so close to my house. 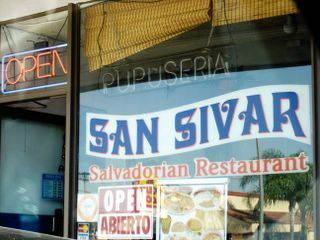 The food of this restaurant is delicious, but I prefer to eat "pupusas" in Salvador because they are masters cooking that, and also that's great becauase they prepare that with their own hands.